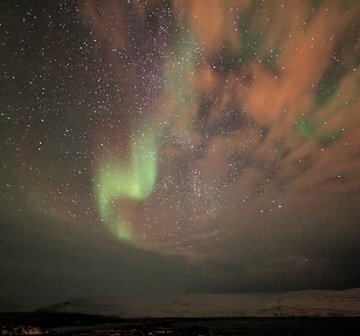 NORTHERN LIGHTS: Did you sleep through the auroras of November? Next time get a wake-up call: Spaceweather PHONE. MOONBOW CHALLENGE: Experts once thought that moonbows--that is, rainbows formed in moonlight--were only visible around the time of a bright full Moon. "Amateur astronomer Martin McKenna has just broken that rule by photographing a moonbow only 7 days before the new moon," announces atmospheric optics expert Les Cowley. "The challenge now is to image one even closer to a new moon." Readers, can you do it? "Who knows," says Cowley, "I might even offer a prize of an umbrella!" Submit your images here. STUNNING SKY SHOW: When the sun goes down tonight, step outside and look south. 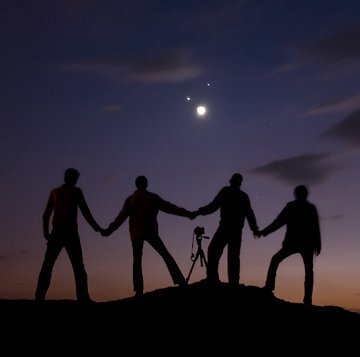 Beaming through the twilight is one of the prettiest things you'll ever see--a tight three-way conjunction of Venus, Jupiter and the crescent Moon: sky map. "It was one the most spectacular conjunctions ever," he says "I took the picture using a Nikon D70s set at 200 ASA for 20s." "November has been a good month for auroras," says Serre. "We've had five clear nights and I saw the Northern Lights every time." Serre's home in far-northern Quebec lies under Earth's auroral oval, a glowing ring around the North Pole where auroras are almost constantly active. Last night's display was encouraged by a crack in Earth's magnetosphere briefly opening and allowing solar wind to pour in. It was a minor display by the standards of Nunavik--"not very beautiful," deadpans Serre, "but we enjoyed it anyway." A better show is in the offing. A solar wind stream is heading for Earth and it could spark geomagnetic storms when it arrives on Dec. 3rd or 4th. High-latitude sky watchers should be alert for auroras. On December 1, 2008 there were 1002 potentially hazardous asteroids.